This year ended on a tragic note for my family, but I would therefore like to conclude the year's blog postings with a post celebrating life. And so I am writing about a tablecloth. In July, on my trip to Africa, I spent a few days in Johannesburg before meeting my group. On my first evening, I was invited to dinner at the beautiful home of Jake and Loren Shepherd, readers of my work that have since become good friends. The table was loaded with food - biltong and other such African fare - but I was able to see part of the tablecloth, and it was not the type of fabric that I expected to see. 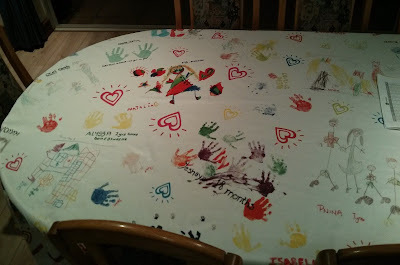 The tablecloth contrasted sharply with the elegant decor of the rest of the house, in that it had children's handprints on it, in brightly colored paint. "That's cute," I said to my hosts. "I assume that these are the handprints of your children?" "Well, sort of," they replied, and explained in more detail. In South Africa, Jewish couples with fertility problems face an added challenge: the high cost of IVF and other fertility treatments. Whereas the evil Zionist Torah-hating Amalekite government of Israel subsidizes such treatments, no such government aid is granted in South Africa. My hosts were deeply involved with a foundation called The Malka Ella Fertility Fund, which provides assistance to such couples in need. As a result of the fund, many children came into existence. A souvenir tablecloth was made, in which all these children contributed artistically, with a picture or a handprint, depending on their age. I thought that it was the most beautiful tablecloth that I had ever seen - a celebration of life itself. May we be able to see and appreciate all that we have to celebrate, and may all the hands of varioushapes and sizes reach outowards each other as one. Shana tova, mevorechet ba’kol. Shnat osher, bracha ve’shalom. "the evil Zionist Torah-hating Amalekite government of Israel"
Sarcasm doesn't go well on the Internet, especially when it provides great quotes like this one. "Even Natan Slifkin says..."
Otherwise, yiyasher kochachah for this and everything that you write. "Whereas the evil Zionist Torah-hating Amalekite government of Israel......"
What is this, is this called for, and on Erev Rosh Hashaha too ? I have never been more disappointed. What a way to end the year, very sad indeed. Just to spell out what I thought was utterly obvious - my point was to rebuff those people who have referred to the Israeli government in those terms, by pointing out that this allegedly "evil, anti-Torah" government pays for fertility treatment! I have obviously over reacted. I should have read into it more, and realized (knowing your sense of humor) that you were only being sarcastic, before commenting. I therefore apologize and retract my comment. I think fertility treatment for Jewish couples in need is but one of the innumerable benefits and blessings that science, when used in the right way, provides. Whereas the evil Zionist Torah-hating Amalekite government of Israel subsidizes such treatments, no such government aid is granted in South Africa.